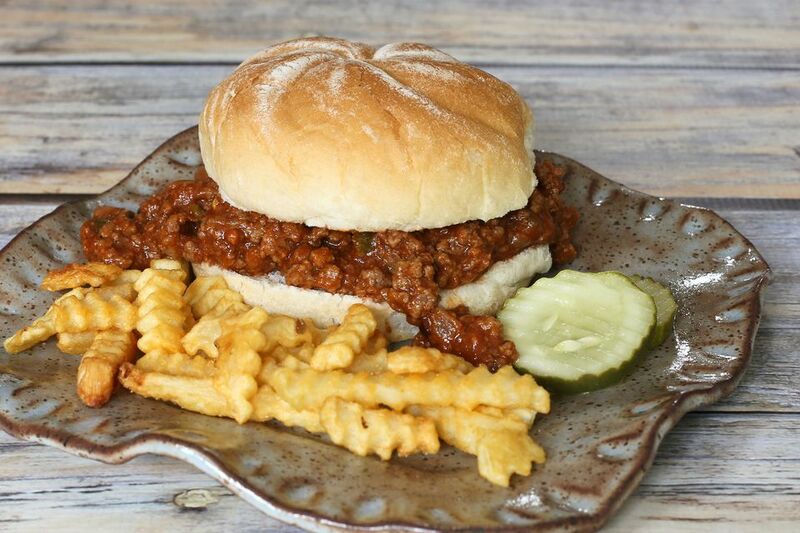 The combination of ground beef and sausage along with the chopped peppers and seasonings give this sloppy Joe sandwich filling mixture excellent flavor. Use bulk Italian sausage, a chorizo blend, or country style breakfast sausage. It's unclear when and where the first sloppy Joe was made, but it is one of many famous American sandwiches. It probably originated in the early 1900s. The first known mention in print was in 1940 in an Ohio restaurant advertisement. This version is made with a few additional ingredients: ground pork, barbecue sauce, mustard, and Worcestershire sauce. Make these tasty sandwiches for a party or family meal. The recipe is easily multiplied for a party or game day gathering. In a large skillet over medium heat, sauté the ground beef and pork sausage with the onion, celery, and bell pepper until the ground meats are no longer pink. Add ketchup, barbecue sauce, water, Worcestershire sauce, mustard, and seasonings to the browned meat. Bring to a simmer and turn to low. Spoon the meat mixture over the split toasted buns or slider buns. Make the sloppy Joe filling with ground beef and ground pork, or use all ground beef. Easy Sliders: Slice a flat of dinner rolls, such King's Hawaiian, in half horizontally. Spread the hot sloppy Joe mixture on the bottom half and top with shredded and coleslaw, if desired. Brush the tops of the rolls with 1 tablespoon of melted butter mixed with 1 teaspoon of Worcestershire sauce. Place the top of the rolls on the filling and wrap in heavy duty foil. Bake in a preheated 350 F oven for about 15 minutes to melt the cheese. If you don't add cheese, skip the melted butter topping and just pull the rolls apart to serve the sliders.